2 of 5 Place bread crumbs and flour separately in 2 shallow dishes and the eggs in a shallow bowl. Coat chicken in flour and dip in egg, shaking off excess. Coat with bread crumbs and place on a plate. 3 of 5 In a large nonstick skillet, heat 2 tablespoons of the oil over medium-high heat. Saute chicken 2 to 3 minutes per side, until browned. 4 of 5 In the bottom of a baking dish, mix 1/4 cup of the marinara sauce with 2 tablespoons water. 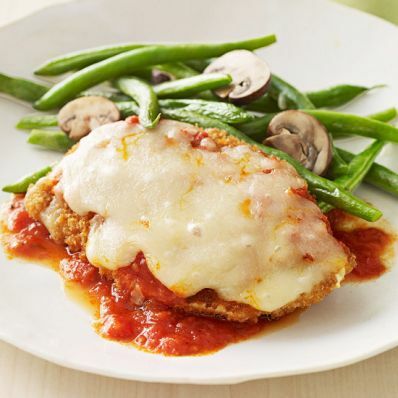 Place chicken in dish and top each with 3 tablespoons sauce and 3 tablespoons cheese. Bake at 350 degrees F, covered, for 15 minutes. 5 of 5 Meanwhile, in a large skillet, simmer broth and garlic, covered, 2 minutes. Add the green beans and mushrooms and simmer, covered, for 5 minutes, until tender. Drain and toss with the remaining teaspoon olive oil and season with salt and pepper. Serve with chicken. Per Serving: 6 g fiber, 453 kcal cal., 38 g pro., 18 g Fat, total, 34 g carb., 5 g sat. fat, 787 mg sodium, 156 mg chol.